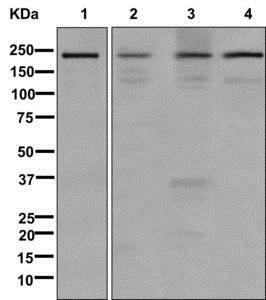 Synthetic peptide within Human Sbf1 aa 1-100 (Cysteine residue). The exact sequence is proprietary. Raji, Ramos, Daudi and Human fetal brain lysates; permeabilized Ramos cells. Our Abpromise guarantee covers the use of ab177146 in the following tested applications. WB 1/1000 - 1/10000. Predicted molecular weight: 208 kDa. Probable pseudophosphatase. Lacks several amino acids in the catalytic pocket which renders it catalytically inactive as a phosphatase. The pocket is however sufficiently preserved to bind phosphorylated substrates, and maybe protect them from phosphatases. Inhibits myoblast differentiation in vitro and induces oncogenic transformation in fibroblasts. May function as a guanine nucleotide exchange factor (GEF) activating RAB28. Promotes the exchange of GDP to GTP, converting inactive GDP-bound Rab proteins into their active GTP-bound form. 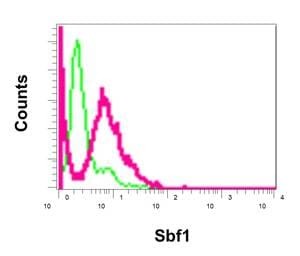 Flow cytometric analysis of permeabilized Ramos cells labeling Sbf1 with ab177146 at 1/10 dilution (red), or a rabbit IgG (negative) (green). Publishing research using ab177146? Please let us know so that we can cite the reference in this datasheet. There are currently no Customer reviews or Questions for ab177146.